Product #757 | SKU 2610-033-110 | 0.0 (no ratings yet) Thanks for your rating! Light weight, comfortable and well-balanced with a super bright LED beam. The Pelican 2610 HeadsUp Lite LED Headlamp provides hands-free light where you need it, when you need it. A dual mode button activates all 3 LEDs for full brightness, or just 1 to extend battery life. The adjustable cloth strap fits comfortably and securely on your head, while the rubber strap grips tightly to hard hats and helmets. Both are included, as well as 3 AAA alkaline cells. 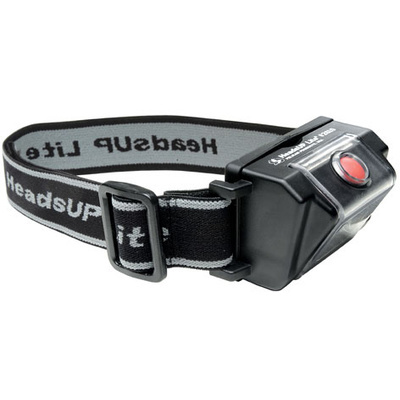 The HeadsUp Lite 2610 is ideal for reading maps and light duties around the campsite.